The Spot: If you're trekking all the way to the West Valley anyway, you might as well duck into Saddle Peak -- a steakhouse that specializes in more exotic game like elk and pheasant, in a gorgeous, foliage-laden environment. 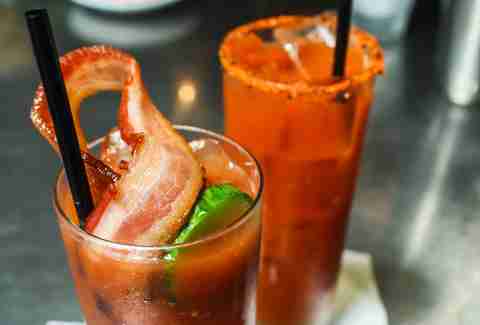 Shelley says: "Bacon-infused vodka is made in house, and for their Bloody, they combine that with a smoky, sweet bacon-like tomato mix, and top it with a thick, crunchy, maple-glazed bacon strip. So, yeah: you gotta like bacon." The Spot: This unlikely neighborhood restaurant in Long Beach is a local favorite, thanks to a family-friendly vibe and monstrous French toast. 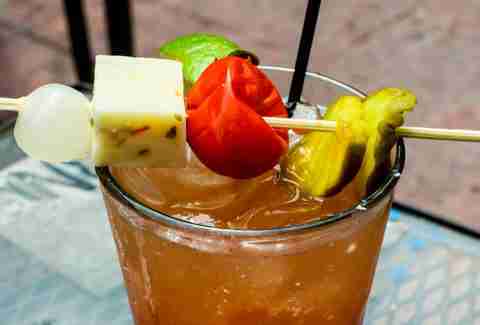 Shelley says: "Slightly sweet and almost hinting of barbecue sauce, this savory tomato cocktail offers a very balanced flavor with just a bit of horseradish spice and a nice hit of Petrov fermented vodka. 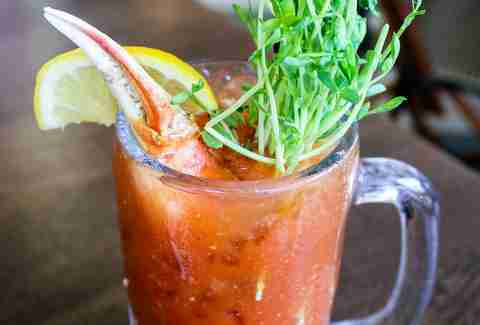 A brightly colored microgreen garnish stands in for the celery, and an equally bright orange stone crab claw not only gives this Bloody Mary-filled mug a nice pop of color, but also provides a delicious snack." The Spot: Formerly an actual home, this, uh, homey place has carved out its Long Beach-staple niche by plating dishes like a bison burger with cayenne bacon and short rib poutine with hand-cut fries. 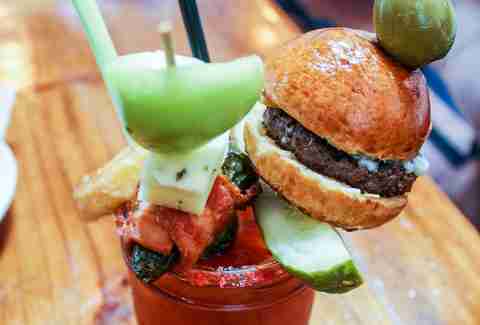 Shelley says: "The Attic’s Bloody Mary menu offers no less than five Bloody Mary variations, including the ability to design your own custom recipe with everything from Slim Jim-stuffed olives to baby back ribs to a 4oz Barik pilsner beer back. 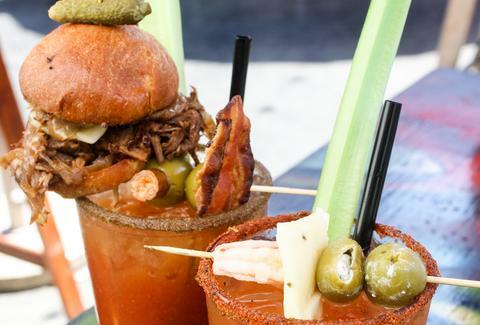 But if you really want to go all out, order 'The Meaty Man', featuring bacon-infused vodka, a celery salt rim, demi sauce, jalapeno Tabasco, and a bacon and short rib slider garnish. 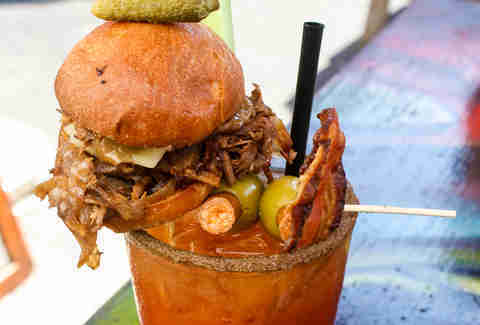 This Bloody doubles as both a meal and a drink." The Spot: Roy Choi's patio-equipped Venice-staurant is perhaps the least-lauded in his eating empire, but that doesn't mean it doesn't match the quality of POT, Kogi, or A-Frame. 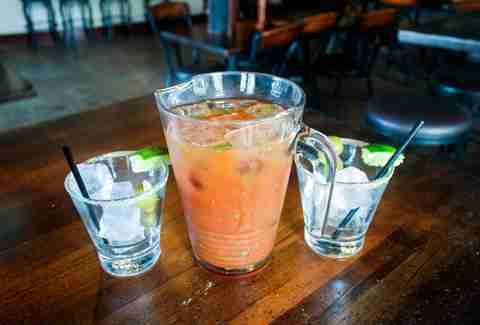 Shelley says: "In my humble opinion, Sunny Spot offers the best all-you-can-drink Bloody Mary deal in the city. $9 gets you one Mary, or with the purchase of an entree, $15 gets you unlimited brunch cocktails. Garnished with a cucumber slice and lime wedge, and rimmed with a complex, salty seasoning, this cocktail brings intricate flavors and a fiery, pepper burn that coats your entire mouth with Caribbean-inspired flair." The Spot: Famous for its burgers, this chi-chi Melrose mainstay is where David Meyers made his name as the chef. Shelly says: "The Maple Bacon Bloody Mary features bacon-infused vodka, maple syrup, cucumber, and a big bacon strip garnish, but the move is the aptly named Rooster Bloody Mary, which consists of vodka, a heavy helping of Sriracha, muddled citrus, and a bright red rim of togarashi -- a peppery Japanese spice mixture." The Spot: This SaMo gastropub is owned by the Broseph Restaurant Group, which tells you pretty much everything you need to know about their dude-friendly vibe. Shelley says: "Now THIS is a Bloody Mary bar. 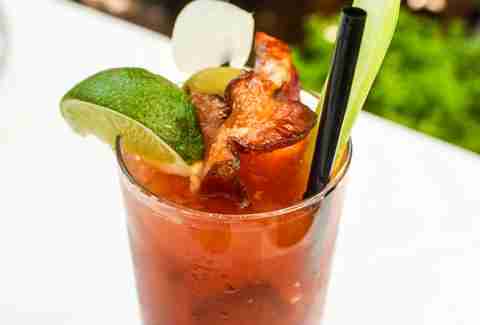 Go for brunch, and get yourself a glass full of vodka and spicy, barbecue-flavored house mix. Then go to work at their massive build-your-own Bloody bar. 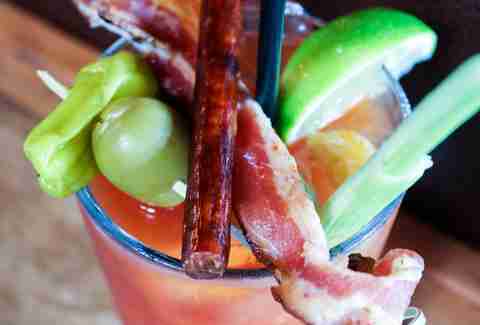 Hot sauces, olives, beef sticks, bacon, pickled everything, and even Brussels sprouts can be added to what will no doubt be a cocktail masterpiece. 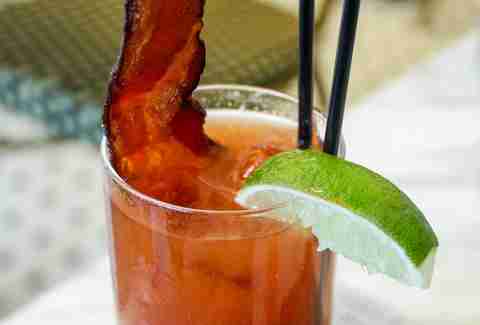 Or just a Bloody Mary with a Slim Jim. Either way, win." The Spot: Beloved by craft beer-aficionados, this mini-chain offers a V-neck-in-Silverlake-level-deep list of quality brews. Shelley says: "At Congregation Ale House, cilantro reigns supreme. With its fresh citrus aroma, this cilantro-spiked Bloody Mary features a strong tomato base that's light in consistency, bright in flavor, and heavy on the booze. And for only $7.50, you’ll get an entire pitcher (yes, I said pitcher) full of this uniquely flavored, properly garnished, and vodka-loaded cocktail." The Spot: Downtown's long-standing hipster-bar go-to for Mexican-themed day-drinking. Shelley says: "$6 gets you a nearly full pint glass of vodka and ice. Then head to the build-your-own Bloody bar where the rest is up to you. Shrimp, bacon, pepper Jack cheese cubes, and an assortment of pickled items are but some of the garnishes available to skewer upon your foot-long bamboo stake." The Spot: That French restaurant at the Grove you've likely walked by approximately 100 times. Shelley says: "Bloody Marys made tableside are a bit like watching the theatrical cooking skills exhibited at your local teppanyaki restaurant. No, it doesn’t really add anything to the food itself, but it’s fun, it’s kitschy, and let’s face it, you enjoy a good show. Morel’s roaming Bloody Mary cart is just that. Watching a friendly bartender grate fresh horseradish root all over your pint-sized Bloody Mary is awesome, and it tastes good. End of story." The Spot: A classic Hollywood date spot hidden in an alcove across the street from the Hollywood ArcLight. 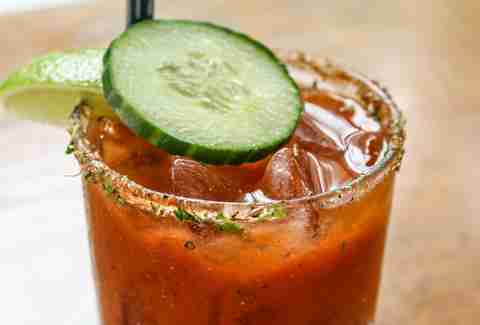 Shelley says: "The Bloodys can be described in one word -- fresh. Fresh tomatoes. Fresh peppers. Fresh everything else. 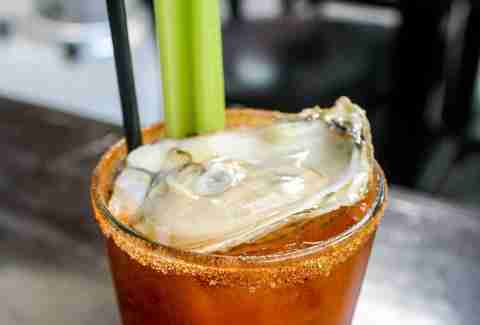 The one to get is the Maryland Mary with a Maryland spice blend and a fresh oyster topper. Fresh." The Spot: This relatively new Beachwood gastro bistro right by UCB has killer tater-tots and duck fat French fries, as well as other things not made from potatoes. 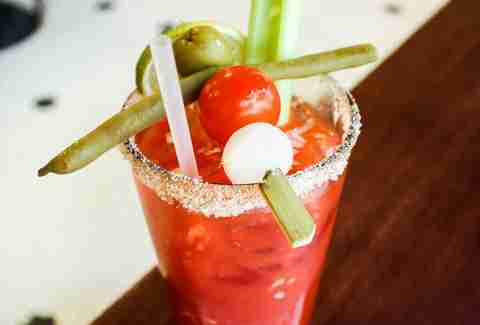 Shelley says: "Their brunch menu's got seven different Bloody Marys, including the Bloody LeRoy (fresh horseradish, BBQ sauce, and a fried onion ring garnish) and the Bloody Maureen (Guinness, house Mary mix, and a pickle spear). But the real highlight of the menu is The Bloody Royale, which's got (deep breath) a celery stalk, green olive, pickle spear, bacon-wrapped roasted jalapeño, pickled tomatillo, a fried onion ring, pepper Jack cheese, a roasted Brussels sprout, and an English burger slider. So, yeah, you may just skip your brunch entree altogether." The Spot: Fig's Chef Ray Garcia's won just about every award there is, and deservedly so: his farm-fresh food's made this restaurant at the Fairmont a destination -- especially for brunch. Shelley says: "California’s duck liver ban unfortunately put the kibosh on Fig’s once-famous foie gras Bloody Mary, but two Bloody variations still remain: the signature FIG Mary offers a citrusy, tangy, light-but-complex tomato mix that's fresh through and through, while the Bloody Maria features Peligroso Reposado Tequila and a prominent bacon strip garnish."